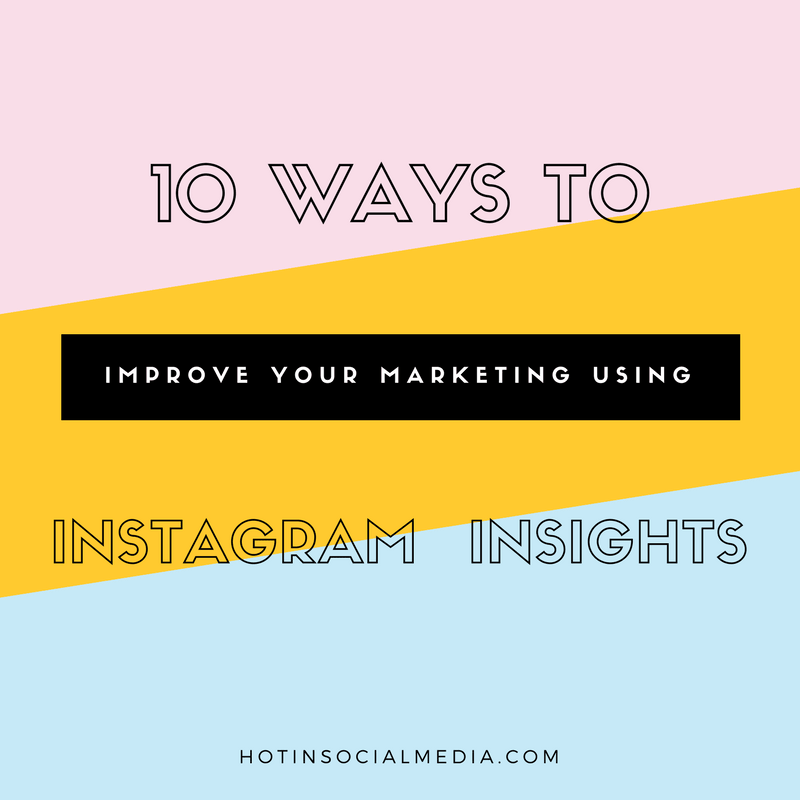 Here are 10 ways to improve your marketing using Instagram Insights with a view towards how you interpret the information you read. There are many misunderstandings about how one should use Instagram insights metrics. This article gives you tips and tricks on how to use them and gives you some user/follower behavior information that you will not find in other articles. Your Instagram insights are going to show you how many impressions your posts have received. When most analysts look at impressions on things such as websites and YouTube videos, they only see a very small part of the picture. There is often a great deal of extra research and analysis needed before any usable information may be drawn. However, the way that Instagram is set up, aka its mechanics, it allows analysts to learn a great deal from their number of impressions. In short, it gives a very strong indication of how well the Instagram marketing campaign is doing. Even if the rest of the campaign, the posts, the sales funnel, the conversion rates, etc., are terrible, if you are drawing people to your Instagram page, then your marketing is working, which means you need to refocus your attention towards areas of your campaign that are not working. Notions of targeting, funneling and segmenting are important, but the way that Instagram works means that you can make large and sweeping assumptions about all your marketing components, based on your number of impressions, and still be mostly correct. Whatever the aim of your Instagram account is, there is a chance that you want people to click a link you have set up somewhere in your account (maybe in your business profile). The number of website clicks is recorded within the Instagram insights tool, and the number of clicks is also measured by whatever analytics you’ve set up on the other end (your website, affiliate account, etc.). Your conversion numbers are obviously the most important metrics that take priority over all other metrics. However, your number of website clicks and your conversion numbers will help you figure out if your “Conversion closing” needs work. Obviously, if you have a high number of website clicks and a very low conversion rate, then you need to fix your closing (Getting to Yes) process to improve its efficiency. One may argue that targeting and segmenting is to blame, and that would be true of most other traffic streams, but not when it comes from Instagram because you already know that the social media network is dominated by women, and that is all the targeting you are going to need with Instagram because you won’t find much room for anything else. The demographics range of women is going to be so diverse that targeting is scarcely important beyond the biggest demographic factors (e.g. culture, age, mothers, etc.). Many people do not realize that their number of video views actually represent how passionate your fans are about you and your posts. A person (posting on Instagram) may have hundreds of followers and thousands of post views per month, but if that person is releasing two videos per month and they are getting very low video-view numbers, then that person has very apathetic/dispassionate fans. Unless the Instagram poster is intentionally creating unwatchable/unsettling videos, the Instagram poster will receive many video views if his or her followers are genuine fans. Think about it, how often do you look at the videos posted by your favorite Instagram posters? In fact, if you are a fan of somebody who posts on Instagram, then you are probably thrilled when he or she posts a video on Instagram. People do not “Like” every post that they enjoy. Think about it, if you were running through a poor-quality Instagram account and you saw a good post, then you may “Like” that single post. However, if you were running through a fantastic profile with multiple brilliant posts, you are very unlikely to “Like” every post. If you want to use your number of “Likes” as a judge, then it is easier than you think. A high-quality account will mostly receive “Likes” for his or her most recent posts. A poor-quality account will receive “Likes” occasionally on older posts and few on newer posts. Monitor Instagram user behavior in real time (looking over people’s shoulders as they are on their phones), and you will see that they usually “Like” the first few posts they see if they are of a high quality. They then stop liking as they scroll through the account even if the account has lots of high-quality content. You can use your Instagram insights to get an idea of the growth of your Instagram audience size. It is not an important metric on its own, but it lets you know that you are doing “Something” right. It isn’t an indication that you are getting it all right, so take it as a pat on the back and nothing more. Think of it as a thumbs up from the Instagram community. Only work with broad generalizations when you are looking at engagement rates because there are many factors to consider, and many of them are outside of your control. They are “Environmental” factors (for want of a better word). For example, if you post fan pictures of a celebrity, and then that celebrity is the center of a scandal, then your average user engagement will go up, but the reason it goes up has nothing to do with you, your posts, or your post/image quality. If you alter your marketing plan, creative direction, and posting plan whenever your average user engagement numbers go up or down, then it is the same as changing your posting/marketing/creative plans whenever it rains outside. Average user engagement rates are useful, but you have to keep in mind that the biggest factors that affect it are usually outside of your control. Just in case you are not keeping track, you can see your number of posts and their consistency through your Instagram insights. At the very least, you can see how consistently you are posting. You may also check to see if you received less or fewer views and followers when you slowed your posting pace. Your Instagram insights will tell you how many people have saved your posts, and this may be one of the most misleading metrics because there are many reasons why a person may save your post. The other metrics you find via Instagram insights are relatively easy to interpret because there are fewer things they may mean, but your “Saved Posts” metric may mean many things. People may be saving your posts because they are very useful, or because they want to share them, or because the post is complex, and they want to save it for later. Some people use Instagram as their fact-finding tool and may wish to flash a post on their phone whenever the next person dares to debate them. Some people save posts for personal reasons, and others so that they may copy from them, edit them, republish them elsewhere, or save them on a hard drive. There are probably more reasons than the ones listed here as to why people save posts, which is why your “Saved Posts” metric is so difficult to interpret. Please do not fall into the trap of listening to, or taking the advice of, people who tell you when you should and shouldn’t post. There are viciously popular Instagram influencers who post three times per month and others who post twice per day. People who tell you how often to post or when to post are selling you empty gift baskets. Your production rate, with a view to top quality, is all that matters. However, if you can produce high-quality posts on a regular basis to the point where you have a bit of a backlog, then you may like to create a posting schedule, and you may do it with your follower activity insight. See how often your followers are on Instagram. If they are only on once per week, then just two or three posts per week will be fine. If they are only on once per month (on average), then posting once per week is all you need. Again, do not base your entire posting schedule on any advice you read (even this advice), or on your follower activity, base it on your production rate with a view to the highest possible post quality. An account may have a very shallow/short reach whereas a post alone may have a very deep and long reach. This is because promoting a single post is very easy, which means that exposing it to many people is not difficult, but the same is not true for a person’s Instagram profile. Your Instagram insights will show you the reach of your posts (your content) by showing you how many unique accounts have viewed a piece of your content. Figuring out each post’s reach using this insight is easy. You may figure out the reach of your profile by taking the reach numbers for the last 15 posts you created and working out the median amount. Through her teenage years, she wanted to be a professional jockey, and then a stand-up comedian, and then a competitive eater, Amanda now works for Wizessay in several administrative roles where she is able to use her “little-bit-of-this and little-bit-of-that” nature within the many roles she fulfills.